As early as today the Senate is set to pass a bill to impose state and local sales tax on all internet purchases, including cigars. Named the “Marketplace Fairness Act” by its supporters, the bill would require internet and mail-order retailers to collect sales tax on all transactions. Currently, such purchases include state sales tax if the retailer has a physical presence in the state where the customer resides, but a Supreme Court ruling prohibits a state or locality from requiring businesses in other jurisdictions to collect such taxes. Technically, consumers may be required to self-report such taxable items, but the reality is only a fraction of those taxes are actually collected. The bill easily passed a procedural hurdle yesterday, and President Obama has issued a statement of support. The bill has moved through the usually slow-moving Senate at breakneck speed, as it was only introduced one week ago while the nation’s attention was focused on the tragic attack in Boston. It’s expected to pass the Senate as soon as today, although it’s not clear if it has the support of a majority of legislators in the House or, critically, Republican House leadership. Critics suggest the bill is “a tax grab and a bureaucratic nightmare…an infringement on states’ rights and a federal encroachment on the almost-sacred ground of Internet commerce.” While that all may be true, the bill poses a special threat to cigars due to the fact that 48 out of 50 states tax cigars with an additional excise tax. Currently only Florida and Pennsylvania don’t have an additional excise tax on cigars (and New Hampshire doesn’t tax “premium cigars”), with over a dozen states taxing cigars at 50% or more of the wholesale or manufacturer price (pdf), which amount to a few dollars per cigar. Given the vast differences in excise taxes, it is no surprise that most of the largest online and catalog retailers are based in Pennsylvania or Florida, including Cigars International, Famous Smoke Shop, and Thompson Cigar. While it’s not clear that online retailers would immediately be subject to excise tax in the same way that they would be for sales tax in the jurisdiction of the customer under the internet sales tax legislation, the bill does appear to clear the legal hurdle to doing so. Under one scenario, states could start demanding that out-of-state retailers begin collecting state tobacco taxes almost immediately, claiming that they are now authorized to do so. Under another scenario, if states faced resistance, it would not be difficult for legislatures to re-brand their excise taxes as a special sales tax. That result would have implications beyond just online and catalog cigar purchases. Currently, one of the best reasons for not raising state OTP excise taxes is that a high tax rate is likely to drive sales online, eliminating tax revenues and pushing purchases away from local businesses. Without states worried about driving sales to untaxed, out-of-state businesses under the so-called “Marketplace Fairness Act,” OTP tobacco tax increases may soon multiply across the country as fiscally strained states look for more revenue. Further, unlike across-the-board sales tax increases which anger wide swaths of voters, targeted tax increases on cigar smokers only affect a small percentage of voters, making them an especially easy target. I haven't read much about this bill other than a WSJ editorial against it, but I doubt it gets through the House in current form, if the WSJ editorial was correct. They said it doesn't attempt to incorporate the "streamlined" sales tax a lot of states have implemented to make online collections easier. The paper said retailers would have to collect state, county and city taxes depending on where the customer lives. That's near impossible. I can't believe it passes with that intact . As for cigars, it's great to get anything without local taxes but you can't really defend it. Like shopping on Amazon, it's a loophole that everyone takes advantage of but you know it's illegal. You can defend it on grounds cigars shouldn't be taxed so egregiously, and that companies based in PA, FL, and the like shouldn’t have to collect taxes for other states. Taxes are always applied in the state the transaction takes place in, not the state the buyer resides. That's not always true, but it doesn't mean the taxed aren't owed somewhere else. If you ordered something from the Sears "wish book" years ago, you may have called Chicago to place the order. But since they probably had a store in your state, you were charged sales tax the same as if you had shopped in person. 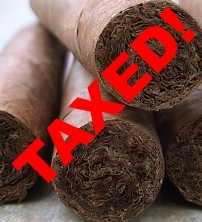 The fact cigars are highly taxed doesn't mean the tax isn't owed. No court has ever accepted the fact a tax is high as a reason not to pay it. While it's true that those taxes are owed by the consumer, the more important effect of online sales not having taxes collected upon purchase is that politicians know that the more they raise taxes the less likely people are to self-report taxes. Even people who pay every cent they owe benefit from the fact that high taxes drive people into the black market. If you don't think high taxes have that effect just look at New York City where cigarette taxes make a pack of cigarettes cost over $10: it's now the cigarette smuggling capital of the country, with estimates that over half of cigarettes in NYC being black or grey market. While anti-tobacco zealots like tobacco taxes because they don't want people to smoke, state legislatures pass them because they want more tax revenues. If raising tax rates doesn't actually increase revenues because it drives people to make purchases where it is more difficult for the state to collect, then we all (including B&M shops) benefit from the downward pressure on tobacco tax rates that result. A few pointed out on twitter that NH doesn't have a cigar excise tax. I've updated the story to note that while non-premium cigars are taxed in NH "premium cigars" (not sure exact ly how they define that) are in fact not taxed in New Hampshire. All states use slightly different wording, but usually "premium cigars" are defined by their size/weight, the fact that they contain natural tobacco only (rather than "predominantly natural tobacco with other non-tobacco ingredients added" like Swisher Sweets, et al. ), and may reference being hand rolled/rolled by hand. There's an interesting exemption, as I read, in the current bill: retailers with under $1 million in out-of-state sales would not have to collect the tax. That could have significant implications for B&Ms in the non- and low-tax states that decide they want to do some Internet/phone sales and could then beat the industry's "big boys" on prices. That is an interesting proposition, although they could never actually get big enough to compete with the big boys without bumping up against the cap. If this comes to pass, I imagine many midsize companies will split up into several small companies each selling specific product lines to stay under the $1M cap. It will be tough to get such a broad tax through the tea party-infused US House. "one of the largest tax increases in US history"? "collecting taxes that are already owed by closing loopholes"? Seems to me they are both accurate. I buy all my cigars online and I am not looking forward to the tax increase. Unfortunately, I can't imagine this having enough opposition to not pass. We will need to rally all the support from within our own Cigar community! Let's go ambassadors of Cigars!!! This is about a lot more than cigars. It's about owed taxes on almost everything bought through the mail or Internet. The cigar lobby is not the industry with a shot at killing this bill. What about sin taxes. For example, here in Delaware we have no sales tax. However, we do have a 15% sin tax on any retailer who brings tobacco products into the state to sell here. If I buy from cigar.com in Pennsylvania, are they liable for the excise tax? What if I win one of the seven boxes stogieguys is giving away for their seventh anniversary. When and where is that taxed? This is because the salesman is trying to get a great commission out of you. That result would have implications beyond just online and catalog cigar purchases. Currently, one of the best reasons for not raising state OTP excise taxes is that a high tax rate is likely to drive sales online, eliminating tax revenues and pushing purchases away from local businesses…please keep on posting….